Will deduct freight charge from payout if my UPS or Freight services are used. Will pay via your choice of payment options. Please call or email with quantity. 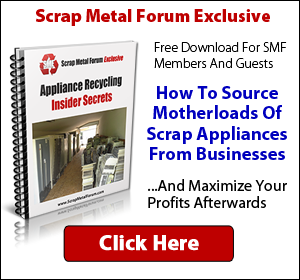 Buying Electronic Precious Metal Scrap! ATTENTION: If interested in working with me, please allow me to send you a quote on shipping picked up at your door! Looking to buy defective, bad sector and smart error hard drives. The prices are for hard drives that can be repaired. If a hard drive can not be repaired, it is paid at scrap price. Clickers or physical damage hard drives cannot be repaired and are considered scrap. Shipping paid if more then 200 lbs. Hard drives should be packed to avoid damage in transit. You dont have a price for incomplete laptops. On complete laptops, you say two things can be missing. Which two things? Also, with the LCDs, are you just looking for the screen? Is it okay if boards get removed? Another "good guy" throws his hat into the ring! Outstanding and Congrats! Hipogear on you question regarding laptops harddrive can be missing plus 2 other items such as battery,disc drive, keyboard or memory. On the LCD's only thing that can be missing is the base the rest of the monitor must be intact. Are you the same guy that is doing the freight thing? So 15" and up monitors? And you pay the shipping? Yes ozzy I am the same guy. Yes I will pay shipping on 15" and up monitors as long as they are complete dont have to send the base. 1 full pallet on its way soon. Very excited and glad to have the room back in my garage! lol Thanks for the great communication and updates! TVs too, or just monitors? Had a pile of LCDs I've been sitting on. Sent in my first lot a few weeks back and another two are going this coming week. Terry makes the whole process very easy. Criteria the same as monitors? Dang, I just asked about TVs last week then went to see my source and told him I didn't have a buyer. Oh well. I'll just take all his computers and audio for now. Maybe then I can go back for the TVs. I didn't understand why there would be a difference in the two from a buyer's perspective. Perhaps you can enlighten us?